Pablo Sandoval the batter. You know, the Giants had a first-inning mess-up yesterday, when Posey and Sandoval — actually, it was Posey who hit out of turn. Sandoval, who was supposed to hit, was then declared out. Posey, who had doubled in a run, then had to come back up a second time, flied out for the third out and that was the end of the inning. But the Giants went on to win the game anyway, four-two. The pitch, way outside to Sandoval, ball one. I remember my very first year, maybe the most outrageous hitting-out-of-turn moment, I mean, really. It was against the Cubs, Chicago Cubs, in Ebbets Field back in 1950. 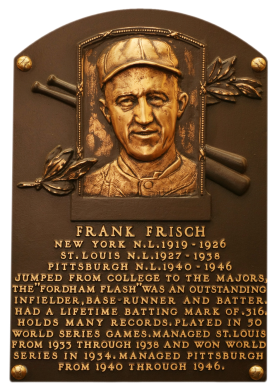 The manager of the Cubs was Frankie Frisch, the Hall of Famer. Here's the one-oh pitch, Sandoval swings, fouls it, one and one. 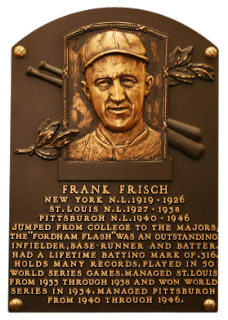 Frisch went to Fordham. He was called the Fordham Flash. I went to Fordham. I was not called the Fordham Flash. And we both knew of each other's background, and I went in to get the lineup from the manager. And he said — in those days, they had to fill out three cards. And he said, "Well, I already filled a card out. I gave it to Spud Johnson. He's out on the field." I said, "Okay, Mr. Frisch, I'll go upstairs." "No, no, no," he said. "Don't go away, I'll give you the lineup." One-one pitch is swung on, lifted around second base. It's Mark Ellis waiting, and makes the catch for the second out. So, Frankie Frisch gave me the lineup and printed out two cards. I went upstairs, and soon as the game started, I thought, "Oh my gosh, I have messed up. I've written the lineup down incorrectly." And all during the game I was trying to correct my scorebook. It was a mess. Ninth inning, bases loaded, two out. The Cubs are trailing the Dodgers by a run. And a left-hand hitter named Carmen Mauro came up to the plate. And I looked and I thought, Well he's been batting — I've made a mess out of my scorebook. He promptly doubled in three runs to give the Cubs an approximate victory. The pitch to Posey in for a strike. And then Burt Shotton, the manager of the Dodgers, did not wear a uniform, so he was not allowed out on the field. 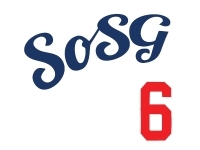 His coach, you would call him a bench coach today, Clyde Sukeforth, came out and said, Carmen Mauro — who had just doubled in three runs — was hitting out of turn. The guy who was supposed to be up was declared out, Mauro had a second at-bat, flied out, and the game was over. Strike-one pitch, low and inside. Things came out of the Chicago dugout that I didn't know were in there. Frankie Frisch just tore up the place. You think that's bad, here's this kid broadcaster, had to go back and see Frisch the next day, and ask him for the lineup. Yeah, that was an out-of-turn mess I will never forget. Although in all honesty, Frank didn't blame me, but I was part of the circumstances that led to it. So, out of turn in the first inning, okay. Out of turn in the ninth with the bases loaded? Wow. The pitch now to Buster Posey, swung on and missed, And the count one and two. Two down, bottom of the first inning, no score. Hunter Pence on deck. Kershaw, very deliberate, plants the left foot just about in the middle of the rubber. Posey, solid right-hand hitter, leader of the Giants. Buster waiting, and the one-two pitch on the way, and that's a change high, two-and-two the count. There is one other thing you might wonder about. You know, the plate umpire gets the official lineup before the game, in the exchange of cards. Well, what the umpire normally does, he puts the lineup in his pocket. But there's no rule that says the umpire, had he known, would have prevented him from saying to Posey, You're hitting out of turn. Ground ball juggled by Ramirez, but they get a force play anyway. No runs, one hit and one left. And at the end of an inning, no score. Thanks for posting. Loved this story. Rule 6.07 Comment: The umpire shall not direct the attention of any person to the presence in the batters box of an improper batter. This rule is designed to require constant vigilance by the players and managers of both teams. The umpire is absolutely constrained from saying anything to the batter or anybody else. It's an appeal play, just like missing first base. The defense can appeal it, but if they don't, it's their own fault. All-purpose excuse: "I gave it to Spud Johnson."